Who says graham cracker or gingerbread houses have to wait until the winter holidays? 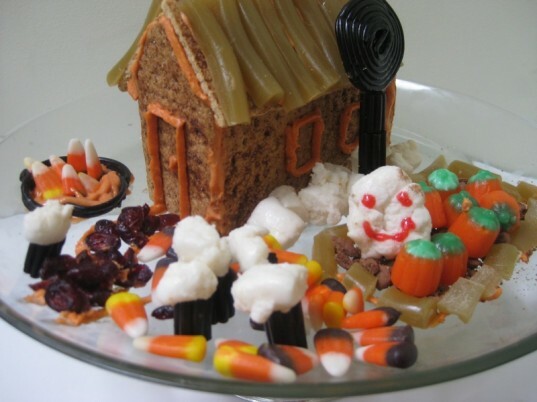 Making a haunted house is a fun activity for kids (and adults of all ages). Shhh....it’s also a great after-Halloween activity to diminish that huge bag of sugary loot they picked up trick-or-treating. 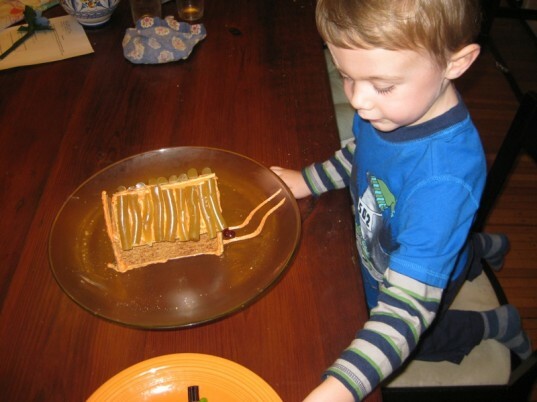 They might have so much fun creating, they won’t even want to eat it afterwards! Read on for a creative and colorful candy craft fit for any age. Gingerbread is the traditional, edible base for making houses, but baking it is time intensive. 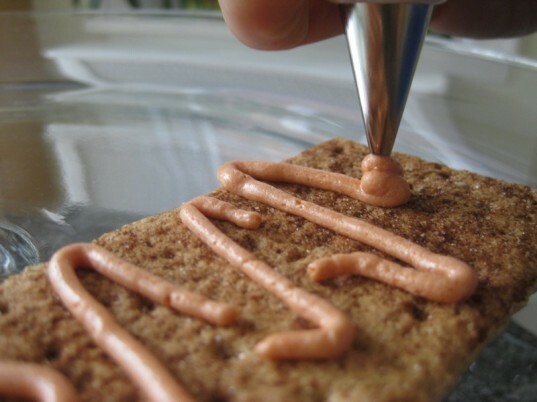 For a quick fix, used graham crackers instead. Before beginning, gather all your Halloween candy and start brainstorming. Let kids sketch out or talk about various decorating ideas. Encourage their creativity, and ask them to think about what they want on top of the house, in the yard, even peeking out through a window. We used licorice tubes and spirals, marshmallows, candy corn, pumpkins, crushed up graham cracker, and cranberries to make a variety of elements including gardens, a sidewalk, and some Tim Burton-esque trees. 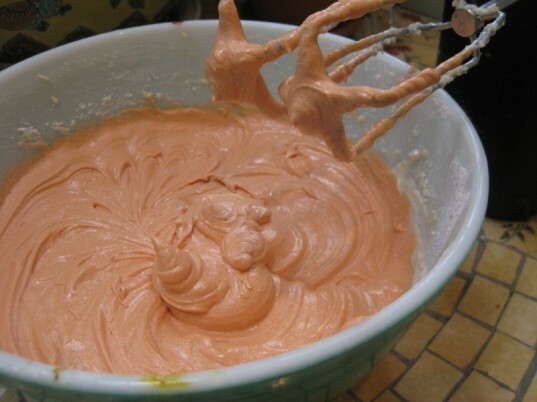 Make or buy a batch of frosting. I like to make my own so that I can control the thickness of the icing. That way, I can also tint it groovy colors with natural food coloring. Basically, you want the frosting to be thick enough to be able to place the candy into it, but not so stiff that the pieces won’t stick to it. Our frosting was a little loose so we put it into the refrigerator for about an hour to let it thicken up. When the frosting is ready, put it into piping bags. A simple piping tip works best for this project. Pick your building surface. It should be smooth and straight for easier building. A large plate will work fine, as will a cake pedestal. For a party, individual recycled paper dinner-sized plates will work fine. 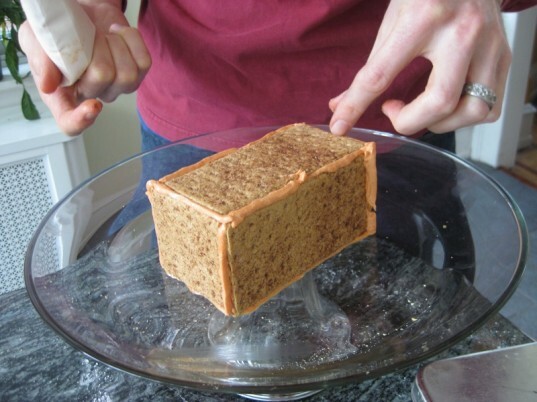 Take out several sheets of graham crackers. Depending on the style of house you make, you will likely need five to nine long sheets (allow a few extra for breakage). For basic gingerbread houses for very little tots, I would recommend just making a house with a flat roof. They still look cute and are much easier for kids to decorate. 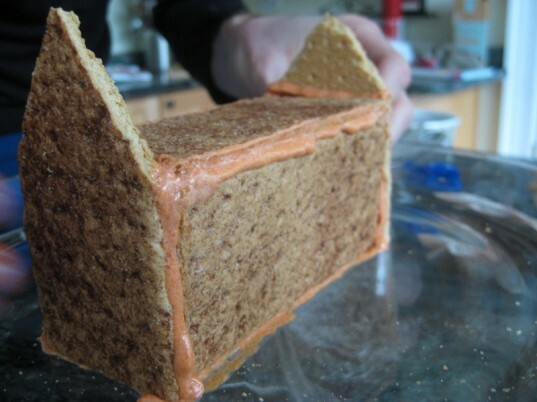 For a more traditional house shape, cut the top part of two long sheets of graham crackers into gables or points, this allows a slanted surface for the roof to be placed upon. 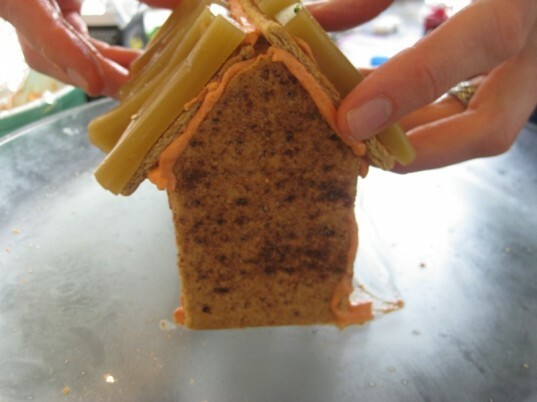 Arrange the pieces, using frosting as glue on each side as well as on the bottom (to stick to whatever surface you have chosen), one at a time into the shape of a house. Do not attach the roof yet. Put your house back in the refrigerator at this point for about a half an hour to let the foundation set up. Another recommendation is to arrange the house around a rice krispie treat to give it support – especially important for little ones! While our house was chilling, we decorated the roof panels and then refrigerated them separately to allow them to set. Add the roof. Let it rest in the refrigerator for about 15 minutes to let it set. 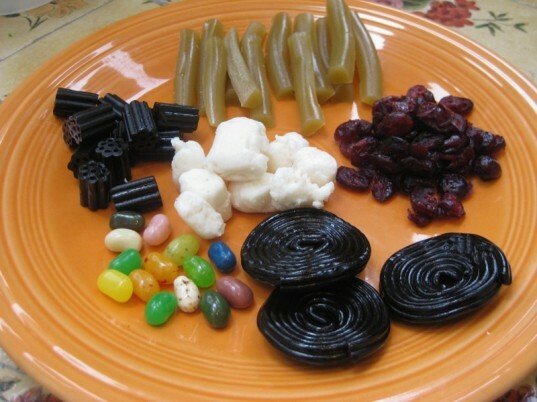 You can use this time to start assembling some of your treats. For example, we stuck a toothpick through two different types of licorice to create a whimsical tree. Take out your house, and go spooky or silly with decoratoins. My son Elijah loved that this was an activity that he could readily participate in. It was messy and fun, and we encouraged him to decide where everything went. The houses don’t have to look any certain way, so he was happy to scatter candy corn “seeds” on the ground and to place pumpkins in the garden. Admire everyone’s handiwork. Try and convince them to use the haunted house as a table decoration. With any luck, the candies will be inedible by the time it’s ready to take them down! Put your house back in the refrigerator at this point for about a half an hour to let the foundation set up. Another recommendation is to arrange the house around a rice krispie treat to give it support - especially important for little ones! While our house was chilling, we decorated the roof panels and then refrigerated them separately to allow them to set.